Like most of you, I’ve been watching the Olympics and as I watched, I remembered a previous Summer Olympics and watching the start of the Women’s Marathon. I noticed something in the body language of one of the front runners and said to my friends, “That runner has asthma; look at her neck.” My friends chuckled and then the announcer talking about the runner I pointed out said that she suffered from asthma. In my Applied Kinesiology practice, I see a number of patients with breathing problems. 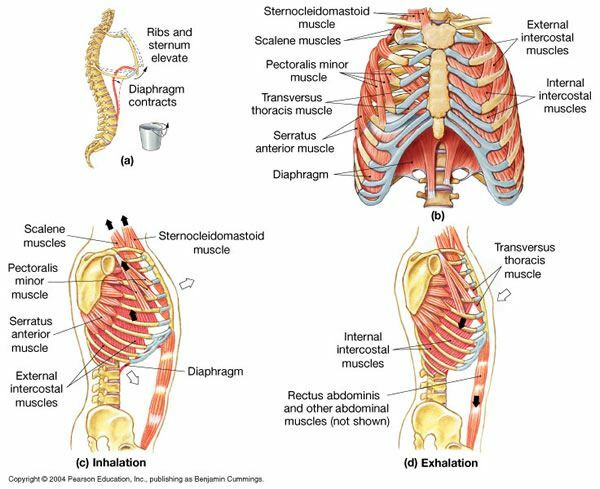 To a person they all have problems using their diaphragm muscle properly, they use small muscles higher up in the chest and shoulders creating a “barrel-shaped” chest. And many have problems w/ their intercostal muscles and the up of down movement of the ribs; their rib joints don’t move properly therefore not allowing the movement of the chest. Tightness and/or weakness is also found in the Pectoralis major & minor, SCM, the Anterior & Middle Scalenes and the Serratus anterior as well as other accessory muscles, they tested to find out if they are inhibited or compensating. The Psoas muscle is also tested as the upper end of the muscle blends into the diaphragm. With applied kinesiology, I can use golgi tendon and muscle spindle reflexes to re-set the muscles and use neuro-lymphatic & neuro-vascular points to flush toxics out of the muscles. I restest the inhibited/weak muscles to get a neural lock in the brain’s muscle center. I use neuro-lymphatic & neuro- vascular pts to help lymph and blood flow to the diaphragm and also give the patient breathing exercises to strengthen the diaphragm. I also stimulate acu-points for the lung meridian and it’s brother/sister pair- the large intestine meridian which may indicate that the patient needs probiotics. The cervical & thoracic spine are checked for subluxations/somatic dysfunction as the nerves from these areas innervate the before mentioned muscles and the lung and are adjusted as needed. The articulations of the rib joints to both the vertebrae and the sternum are also important to check. Working on all these aspects causes the bio-mechanics of the chest to work better and breathing is freed up. Of course causes of both bronchial and lung and general inflammation need to be found and worked on via nutrition and lifestyle changes; but that is another blog. And please check out the Patient Testimonials at my web site. This entry was posted in Applied kinesiology, asthma, Dr. Vittoria Repetto, muscle testing, neuro-lymphatics, nutritional evaluation, NYC, NYC Applied kinesiologist, NYC chiropractor, pectoralis muscle and tagged 10011 applied kinesiologist, 10011 chiropractor, 10011 chirorpactor, 10011 neuro kinetic therapy, 10011 neuro kinetics, 10013 applied kinesiologist, 10013 chiropractor, 10014 applied kinesiologist, 10014 chiropractor, 10014 neurokinetic therapisrt, 230 w 13th st. ny 10011, 455 W. 23rd St NYC 10011, aol.com, applied kinesiologist, applied kinesiologist 10011, Applied kinesiology, applied kinesiology practitioner, asthma, best applied kinesiologist, best chiropractor, best nyc applied kinesiologist, best nyc chiropractor, best woman applied kinesiologist, bing.com, breathing, chelsea applied kinesiologist, chelsea chiropractor, chiropractic, chiropractor 10011, diaphragm, downtown applied kinesiologist, downtown chiropractor, downtown manhattan applied kinesiologist, downtown manhattan chiropractor, downtown manhattan neurokinetic therapist, downtown neuro kinetic therapist, downtown NY chiropractor, downtown nyc applied kinesiologist, downtown nyc chiropractor, dr mercola, dr weil, Dr. George Goodheart, Dr. Vittoria Repetto, golgi tendon reflexes, google.com, http://www.facebook.com/pages/London-Terrace-Chiropractic-Applied-Kinesiology/109622855768202, http://www.icakusa.com, hypochlorhydria, london terrace applied kinesiologist, london terrace chiropractic, london terrace chiropractic & applied kinesiology, msn.com, muscle spindle reflexes, neuro-lymphatics, neuro-vascular, NYC Applied kinesiologist, NYC chiropractor, olympics, pectoralis major, pectoralis minor, Serratus Anterior, sports, west Broadway Chiropractic, west village applied kinesiologist, west village chiropractic, west village chiropractor, west village neuro kinetic therapy, woman 10011 applied kinesiologist, woman 10011 chiropractor, woman applied kinesiologist, woman chiropractor, woman neuro kinetics, woman nyc applied kinesiologist, woman nyc chiropractor, Wordpress, www.drvittoriarepetto.com, www.drvittoriarepetto.meta-ehealth.com, www.drvittoriarepetto.wordpress.com, www.westbroadwaychiropractic.com, yahoo.com. Bookmark the permalink. When I was hurt in that motorcycle accident my life would be changed for good. Unfortunately that driver had no car insurance and I was going to be in pain for ever. How dreadful was it? I has bedridden for 3 months, I had to have constant care and my clinic bills went through the roof! In searching for sites related to web hosting also to specifically comparison hosting linux plan web, your web page came up. Wow! Thank you! I constantly wanted to write in my web-site some thing like which. Can I get important part of your post to my blog? Just refer to the URL of the post. Hello,After reading you site, Your site is very useful for me .I bookmarked your site! This is a great site, thanks for sharing. I’ve browse through some articles in your site at this point. I love your style of blogging. I included it to my bookmark and will also be coming back soon. Take a look at my personal website as well and tell me how you feel. Wow, I was lucky to find this page when I was looking for some info on Ask! Keep up the great writing! I am often to running a blog and i really recognize your content. The article has actually peaks my interest. I am going to bookmark your site and keep checking for new information. Very interesting posts on your website. I keep on coming back to learn more. I have bookmarked it as well for future reference. I hope you dont mind at all. There’s certainly a great deal to learn about this. I think you created the right points as well. I really like your blog, the way you create posts and subject you covered are just fantastic. I understand how hard it is to get the site visitors involved. I have decided to add your blog to my blog list. Nice knowledge! I have been previously seeking something like this for a little bit now Many thanks!